In the 1960s and 1970s, the artist Ed Ruscha created a series of small photo-conceptual artist's books, among them Twentysix Gas Stations, Various Small Fires, Every Building on the Sunset Strip, Thirtyfour Parking Lots, Real Estate Opportunities, and A Few Palm Trees. Featuring mundane subjects photographed prosaically, with idiosyncratically deadpan titles, these "small books" were sought after, collected, and loved by Ruscha's fans and fellow artists. 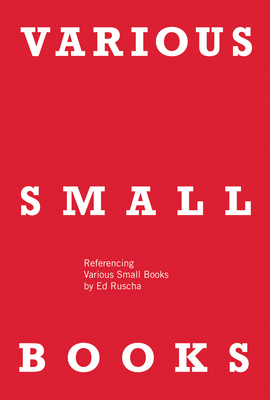 Over the past thirty years, close to 100 other small books that appropriated or paid homage to Ruscha's have appeared throughout the world. This book collects ninety-one of these projects, showcasing the cover and sample layouts from each along with a description of the work. It also includes selections from Ruscha's books and an appendix listing all known Ruscha book tributes.